Bernie and Toby Linder have called Ardenwoods their home for almost two years. Prior to their move up the hill, they resided in Laurel Park. Toby was a first grade teacher at Hillendale Elementary and Bernie worked for General Electric. It was through his work with GE’s Elfun Society that Bernie and Toby initially got involved with the nonprofit community in Hendersonville. 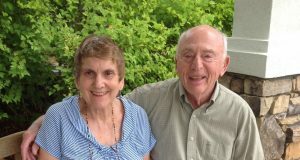 The Linders’ involvement in the Community Foundation of Henderson County is extensive. From Bernie’s role on the Board of Directors, Toby’s involvement on the Scholarship Committee, and their donor advised fund the Linder Family Charitable Fund, it’s no surprise that in 2017 the Linders were named the recipients of the Community Foundation’s Sauer Charitable Award. The Sauer Award is the Community Foundation’s highest honor, presented at their Annual Luncheon to celebrate individuals who provide outstanding leadership through their personal philanthropic efforts in Henderson County. Toby and Bernie agree that their goal in all charitable giving efforts is to make life better for the generations to come, which is a main reason that they have such a vested interest in the local park development. Here at Ardenwoods, the Linders continue their community involvement. Bernie chairs the Activities Committee and serves on the Residents’ Council. Toby is on the Employee Appreciation Fund Committee and is involved with keeping the library up and running. The Linders decided to make the move to Ardenwoods because they felt that the apartments were the perfect size for what they needed in a home at this stage of their life. When considering where they wanted to move, they knew they wanted a smaller environment that would function as a true community, which is what they found at Ardenwoods. They both feel that the relationships they’ve forged with the other members of the community have developed into true friendships.